When we talk about wedding the first concern that arises is the cost and design of wedding ring the couple would be using. The couple will wear the ring for the rest of their earthly life so it should be something that will really last forever. 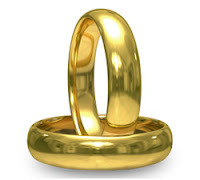 It would actually be a crucial task to look for a jewelry store that offers affordable yet elegant wedding bands. Good thing there is 25karats.com that specialized in different kinds of rings that will really suites to everyone’s jewelry needs. Name it and they have it. A visit to their site is in fact worthy. By the way few months from now it will be our most awaited day, our wedding. I’m excited and at the same time nervous as the day go by. The first thing that I did with regard to preparation was look for a design for my gown as well as for the entourage. While my fiancée was busy searching for our wedding ring and he was able to find one with a beautiful design. It’s a two tone ring. What is so nice about it was the 10 percent discount he got. Lol. Like week of September I visited the jewelry store for engraving and resizing. I will get a hold of it by next week. Prior to wedding ring stuff of course he bought me a diamond engagement ring. I love it so much. Anyway when we celebrate our 1st anniversary I will be the one who will buy our anniversary rings. wow congratulations in advance abie =) you're on the way to your dream...best wishes! Congratulation on what will be an amazing day for you and your new husband to be! Your ring reminded me of our ring. It was a momentous event in our life and it will be for you too. @jEnie, thanks for the visit. tHanks. I will leave a footprints there.hehe. @ Layla. Thank you.I know it will just like yours.